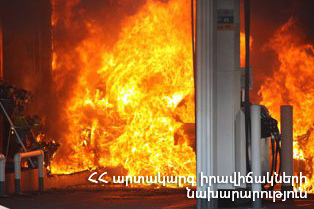 On April 11, at 08:52 an emergency call was received to “911” service that a fire had broken out in a gas filling station in Rubinyants street, Yerevan. The emergency response group of the National Crisis Management Center and four fire brigades from the fire and rescue squad of the rescue service of MES of RA dispatched to the scene. It turned out that the fire had broken out in the gas filling station transformer room (about 20 m2) at 41/1 Rubinyants street. The fire was isolated at 05:48 and extinguished at 06:05. Electric meters, fuses and wires (about 10 running meters) burnt, the hanging ceiling (about 4 m2) was damaged. As a result, there were no casualties.